Hi everyone! Suwabe (@gsc_suwabe) from the Corporate Planning Division here! I was born in Summer so I feel I have a bit of an affinity for sunflowers! The colorful gradient of her hair has also been preserved and also makes use of translucent parts to capture the unique charm of the illustration in figure form! Enjoy the playful appearance of Io as she looks out to the sea for the first time! The Little Lady of Midsummer also known as the Summer version of Io is becoming a 1/7th scale figure! Her superb skin color and the sculpting of the muscles as they pull tight in her pose are both fantastic! Not to mention the dynamic sculpting of her colorful hair and the careful shading done throughout the figure! The large sunflower she is holding also has such a powerful presence, creating a figure filled with highlights! Io is well known for her darker skin tone and the swimsuit just matches up with the tanned appearance so perfectly! Apparently the color went through a number of changes through the prototype stages, but through trial and error finally managed to reach this lovely appearance! ▲ The contrast of the swimsuit with her skin makes for such a nice color balance! Scale figures that reveal a lot of skin are often defined by how the muscles and tendons are sculpted! Keeping these looking realistic as well as appealing is one of those things that really shows a high quality figure! The way those muscles are sculpted around her stomach!! I can’t help but want to touch them!! ▼ Such an incredible feeling of movement…! ▼ Such an outstanding gradient…! Don’t think that this flower is just an extra! 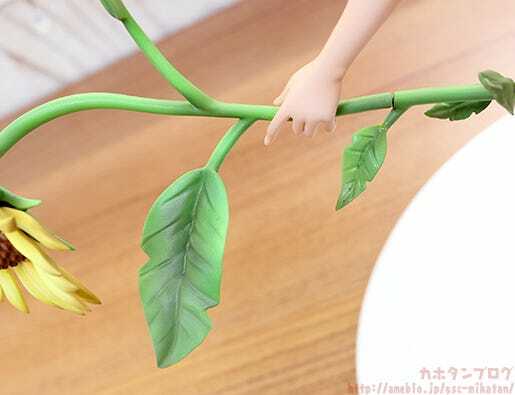 With Io sculpted so adorably it would be rather disappointing of the sunflower didn’t match her quality… but just look at the little details on both the sculpt and the paintwork! The slightly darker gradient of the petals toward the ends and the multiple layers of the seed head make it look like she is really holding a freshly picked sunflower! ▲ The leaves are also very detailed! Ready for some photosynthesis! Anyway that’s all from me for today! See you all again soon!